Place: Kuntibetta and Thonnur lake. 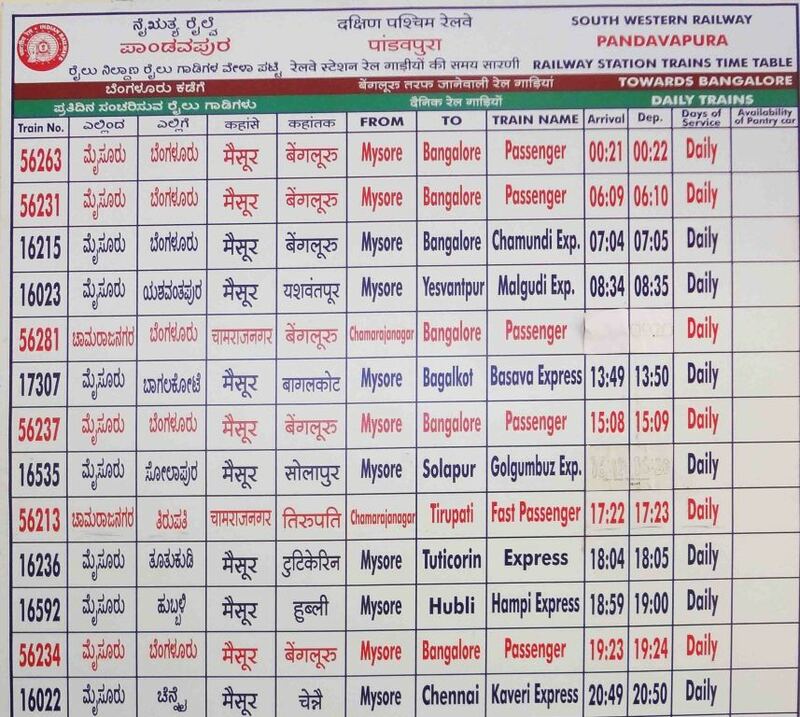 Transportation: Bangalore to Padavpura in train -> Padavpura station to Kunti betta base in auto. 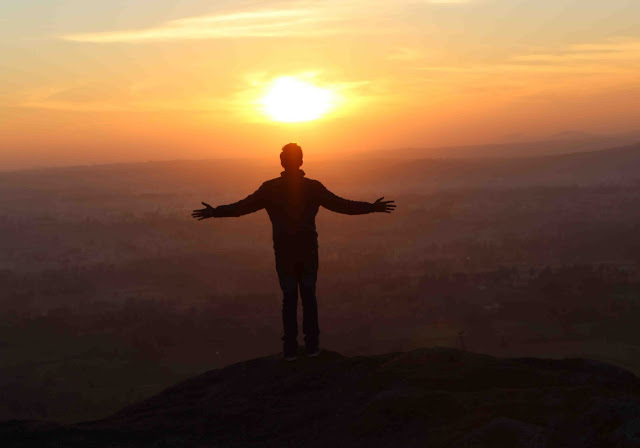 First rays of the sun falling on your cheek could be the best way possible to celebrate new year but unfortunately plan got postponed by a day, "if its not first sunrise of the year let it be the second" I said to myself. 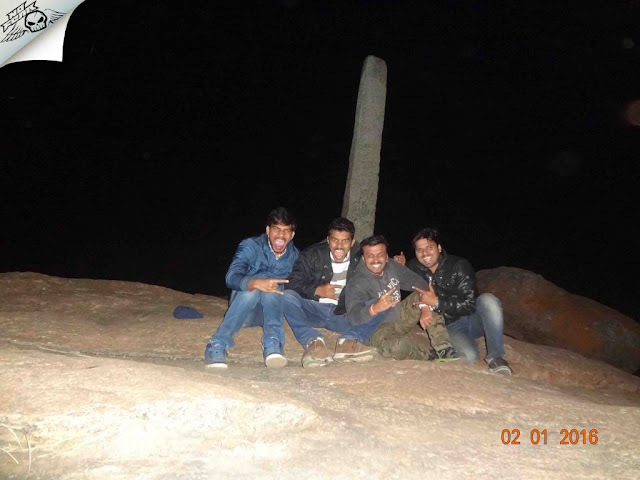 Night trek to Kunti betta was always on my bucket list since long time. Riding so long + trekking + sleepless night + riding back seemed too tiring, hiring a cab was impracticable as we were only 4 on the confirm list. 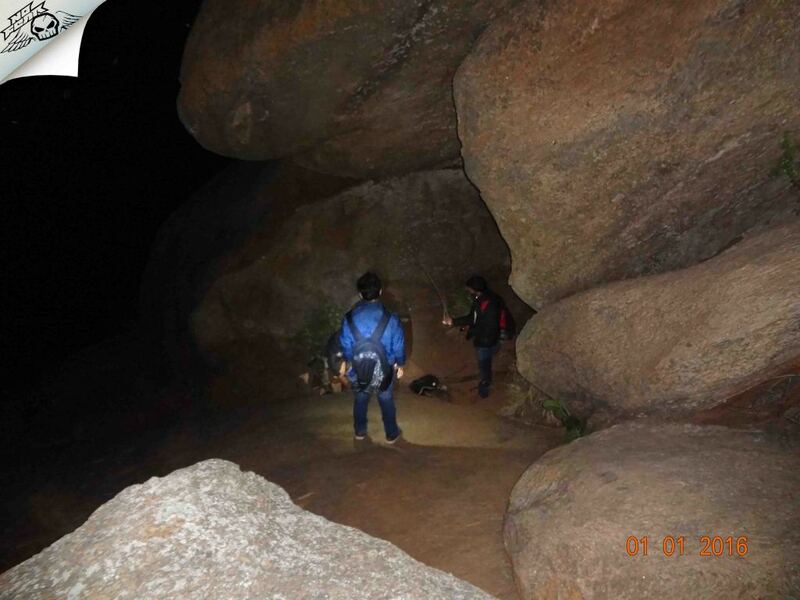 Thrillopia was conducting night trek on the same day for Rs. 1300/head but it seemed too expensive so we decided to take public transport. 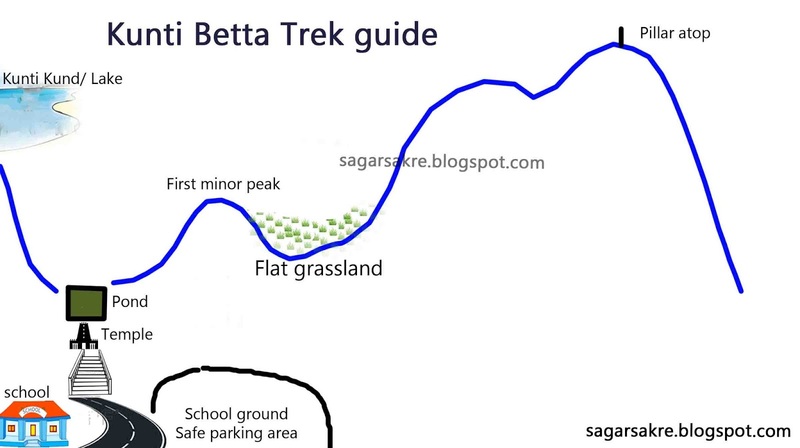 There is very less information about night trek to Kunti betta specially with public transport, so I am going to explain in dept so as to help fellow trekkers. We chose train and local auto's for the transport which worked out really well. Kunti Betta: Kunti Betta are two rocky hills surrounded by sugarcane, paddy fields and coconut trees in the Padavpura. 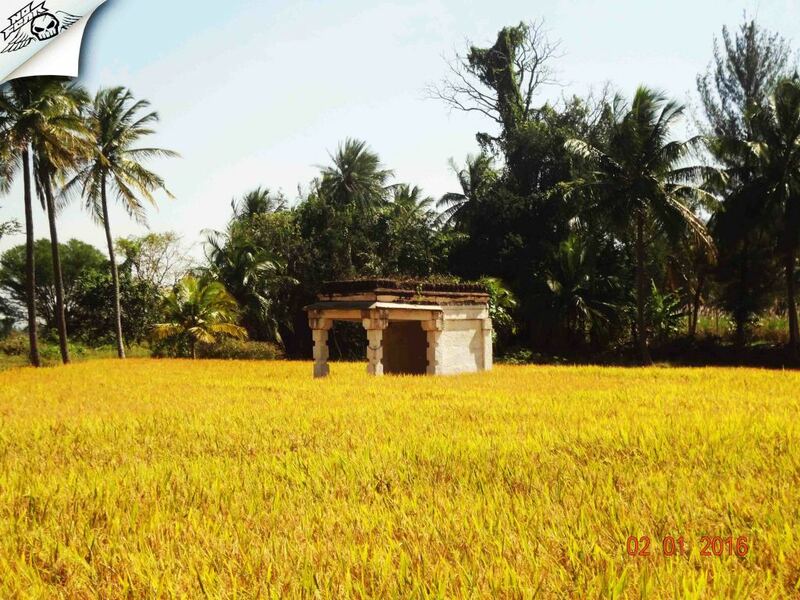 The place has a historical importance as it is said that Kunti along with her five sons stayed here during their excile. 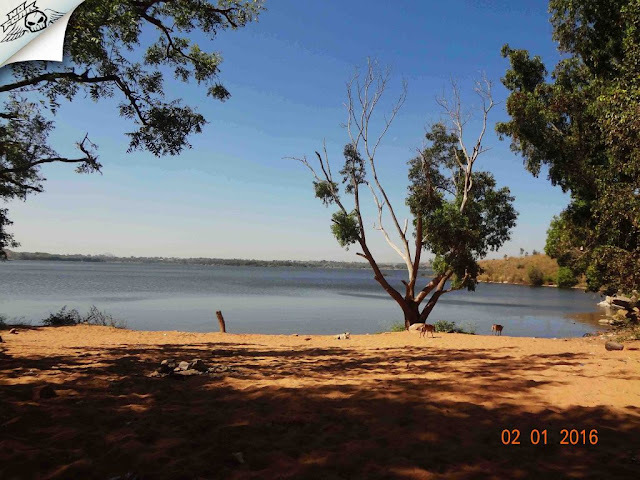 Thonnur Lake: It is the serene and unspoiled beauty of a pristine lake called Kere Tonnur. 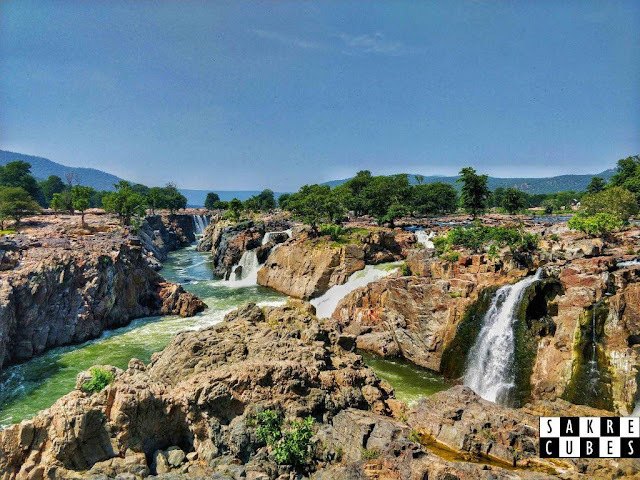 It's a man made water barrage across Yadavanadi connecting two rocky hills and built from the times of king Ramanuja around 1000 years ago. Friday Evening: Bangalore-Mysore local train was scheduled at 7 pm, Naresh and Vinay were already waiting for me at City Railway station, Akhil was supposed to join us at Kengeri. 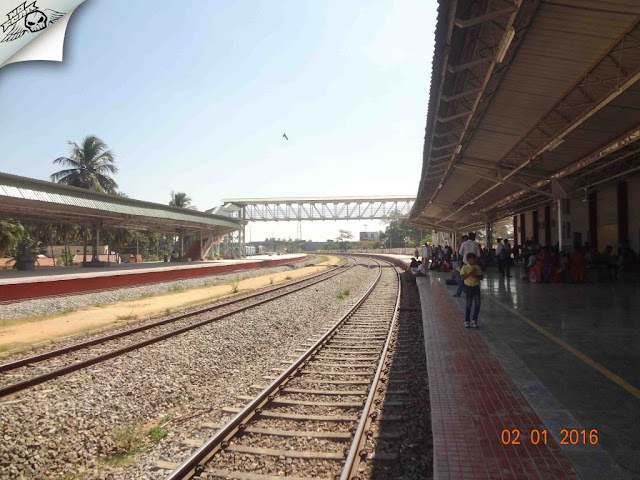 Train Journey: The train departed sharp at 7 pm and reached Kengeri by 7.30 where Akhil joined us. After a little struggle we managed to get seats. We were excited about the trek but at the same time were afraid of the dark. Since Thrillopia had event on the same day they were our only hope as we didn't wanted to be the lone soul at the hills. I read Travel Reminiscence and took screen shots of getbeyonglimits' post for the directions just in case we miss the route (It saved our day, read-on to know why). The best thing with travelling in train is you get to eat something every alternate minute, maddur vade being the best we tried. Pandavapura: We reached Pandavapura at 10 pm, as we came out of the station we got a shared auto to Pandavapura town. Auto dropped us at Padavapura from where we need to catch another auto to Kunti betta base. We asked the driver about good place for dinner. He suggested a local dhaba as they will be open at night and serves good food. We asked him to take us to dhaba then later drop us to Kunti betta base. He demanded 150 rs for the entire trip which seemed fair deal. He dropped us at Nisarga Daba, after having good dinner we called the driver to drop us to Kunti betta. 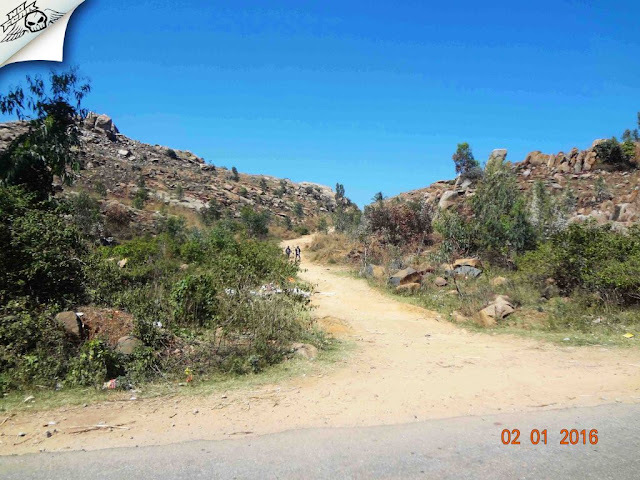 From Pandavpura to Kunti betta base is nearly 4 km, walking this stretch is not possible at night but during day time you get plenty of shared auto and buses who will drop you at kunti betta diversion from where one need to walk another kilometer. He dropped us in front of the govt school and pointed the starting point for the trekking. There is plenty of space for parking vehicles at this place and its safe to park over night (confirmed with locals). Trekking: Initially there are 50 odd steps after which you find flat ground. There is a temple, a pond in the middle, a big Ganesha statue and massive hills on either side. We knew hill with pillar atop need to be conquered but didn't know which side. In day you can see the pillar from far distance but at night its not possible to spot. We called the auto driver who informed us to climb the hill on the right side. 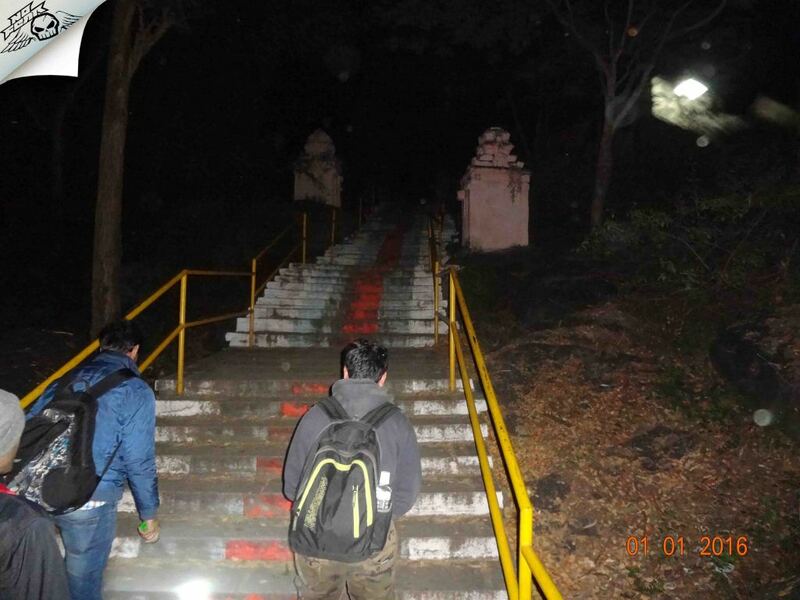 There were misleading steps beside the Ganesha statue, I opened saved page of the blog to get clue of the initial trail. There's a steep rock to the right just after the pond. If you are able to spot it then you are good to go. 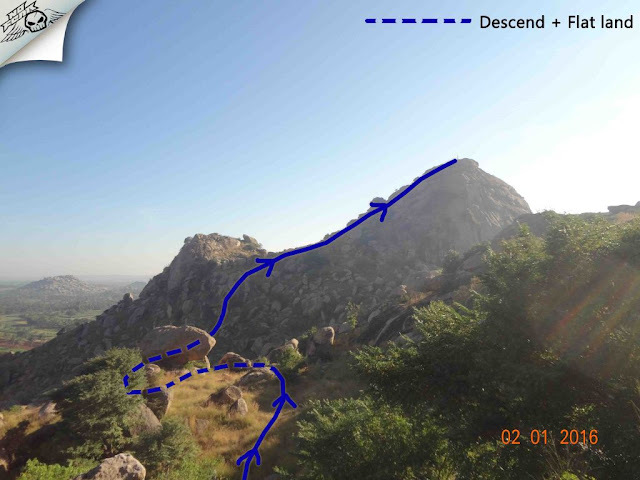 In day time it wont be much difficult to find the route but at night it will be little difficult and there will be no one around to help you. 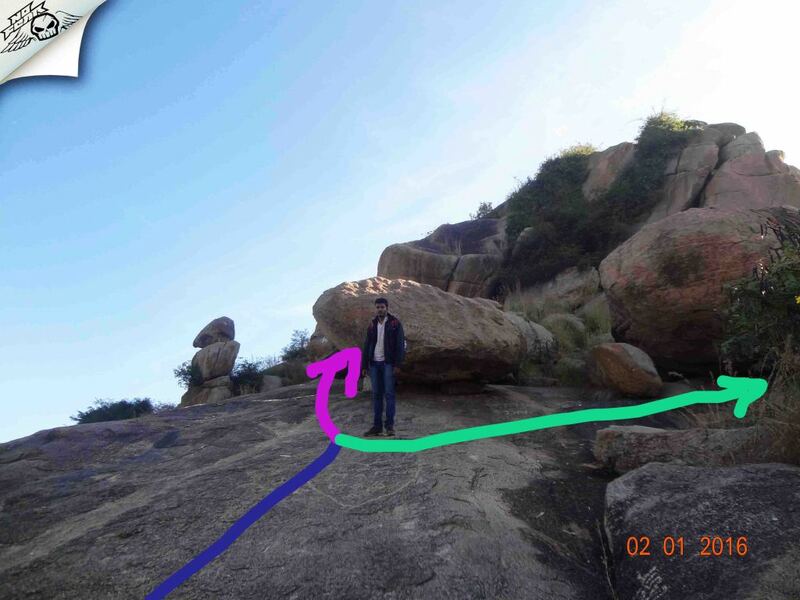 False peak: The initial trail was a little steep we had to climb steep rock for nearly 2-3 minutes then you hit a big boulder, now there are two routes on either side of this boulder (Refer below image). We took the left path, though the trail is clear the path was little tough. We had to climb couple of medium sized boulders until we hit a massive rock. 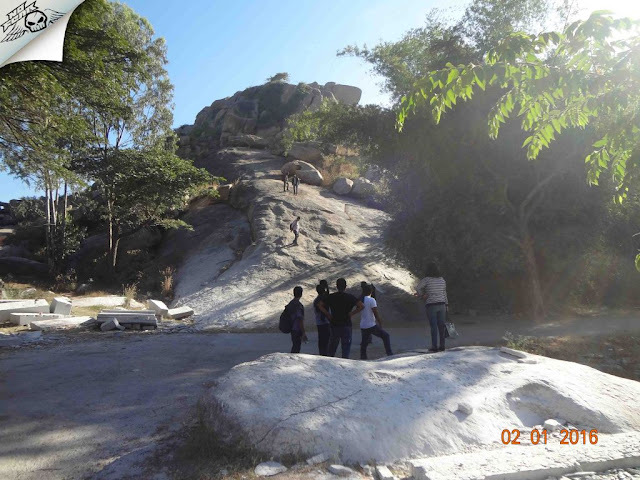 It was challenging to climb this big rock, somehow with the help of each other we managed to cross it. We saw another path merging from the right side, the one that comes from the right side of the boulder I mentioned earlier. Took another 15 minutes to reach the peak. But wait!! the summit is earmarked by the pillar but where is it? We saw another hill next to us almost 5 times bigger which seemed impossible to climb. We sat there for a while and read the reference blog again. It was clearly mentioned that that we had to climb the second hill as well. Looking to the other side Kunti betta with the pillar atop would be visible, on its left side there's another small adjoining hill. Chasing the summit: The trail is much clear from this point on wards. We need to descend the first hill pass through the flat grassland and ascend the second hill. There's a small cave en-route which is a very good spot for camp fire and keep yourself warm but we had a long way to go so we moved on. We just have to keep the direction of the hill in mind so as not to take wrong turn, after the flat grassland we started ascending. The ascend was a little difficult as the boulders are big, one had to crawl and take help of others to cross the boulders. 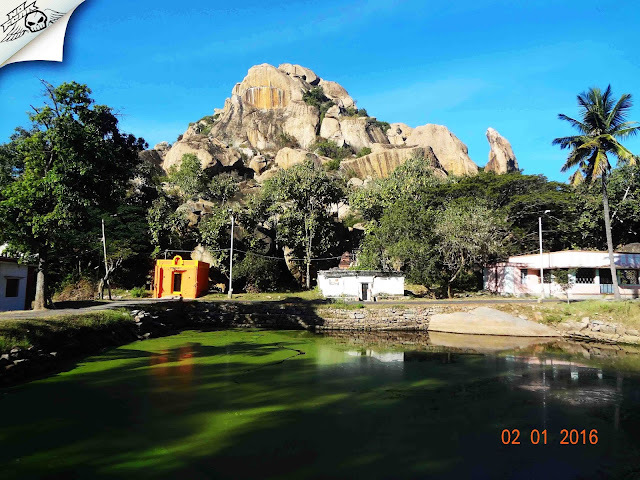 As you near the summit spectacular surroundings makes one feel the glory of Pandavas unfolded before their eyes. 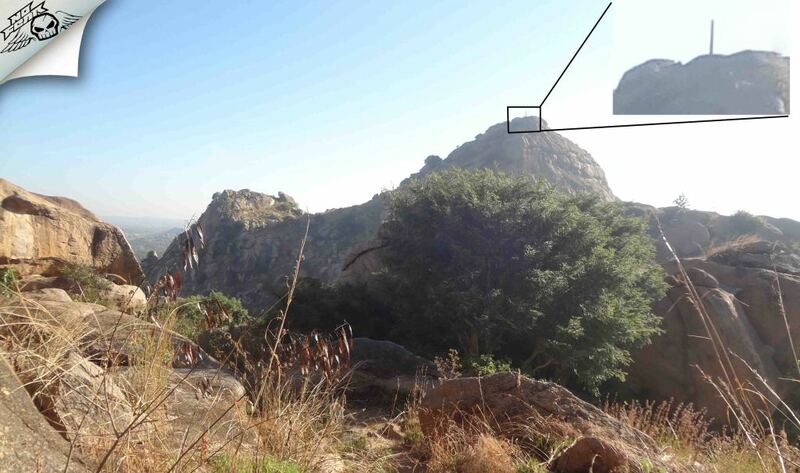 We finally reached the summit where the first thing we spotted was the big pillar which is believed to be used by Kunti during regime of Pandavas. I had a quick look around the place to see if we were the only soul at the place and yes we were the only ones on the hills. Descend the first hill pass through the flat grass land then ascend the next hill. It was 2 am in the morning though it wasn't much cold, if we had to survive through the night we had to lit a campfire. There were plenty of partially burnt wood from the previous campfires which made our life easy. Kaurava's attack: We were waiting for the Thrillopia group then we saw movements at the base of the hills. 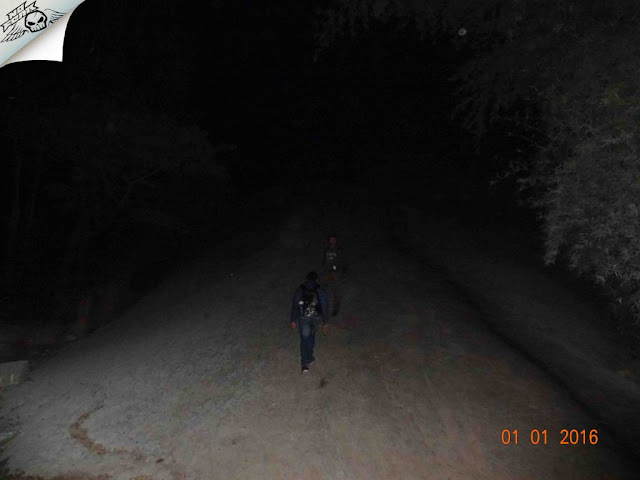 As they started trekking we could see a long line of trekkers with torches in their hands. About an hour later guide arrived first, I asked him the group size he said the head count is around 100. Ohhh myyyy god!!! I didn't expect such a big number especially at this place that too at night. Within no time the place got crowded we had to share the campfire with them. Upon talking with few of them got to know that they had come through various trekking groups and some were independent. Though seeing them was a relief for a second, the peace of mind was blown away in no time. Loud music playing all around, girls talking nonstop, groups singing songs, guys smoking and drinking (silently), uffff!!! we just wanted night to get over soon. A big number of trekkers gathered atop. Sunrise: It was 3.30 am, we had to wait approximately for 3 hours for the sunrise. Sitting in front of the campfire and looking at girls was a good time killer ;) The temperature dropped eventually, campfire helped us fight the cold. Couple of hours later light slowly seeped-in to takeaway the darkness, everyone sat facing east to capture the rising sun in their eyes and lenses. 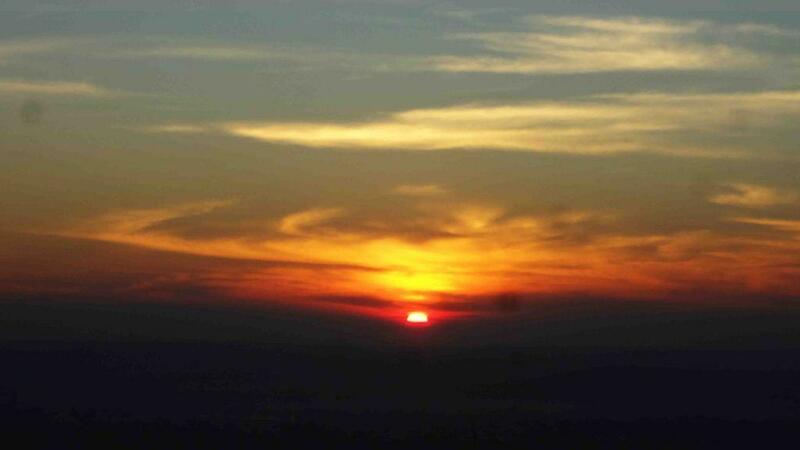 As it was cloudy at the horizon the sun was obscured by the clouds. Nearly half an hour later we saw the first glimpse of Sun - the second sunrise of the year. 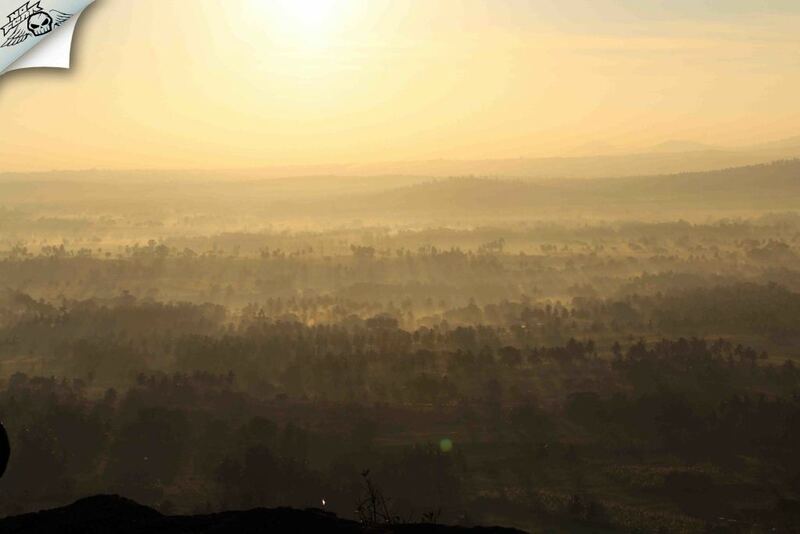 Seeing the rising sun was a treat to the eyes, the paddy fields at the bottom scattered the sun rays making landscape view look more spectacular. 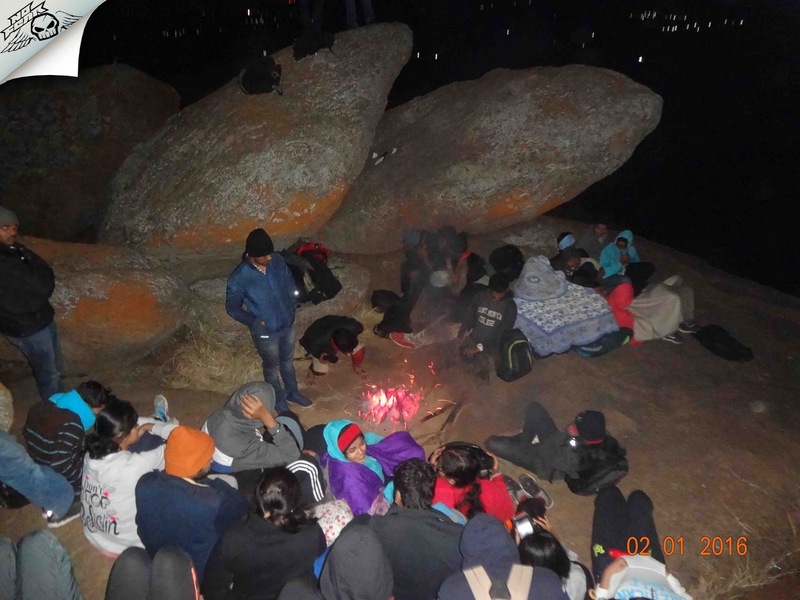 People who had come with the trekking groups had to leave as they had time constraints. Soon after the sunrise everyone left except another small group. Now the place was empty we had enough space to breath in. Captured a lot of photos especially at the vertical drop edge. Getting a photo at this cliff is thrilling but equally dangerous, a slip can lead one to death. 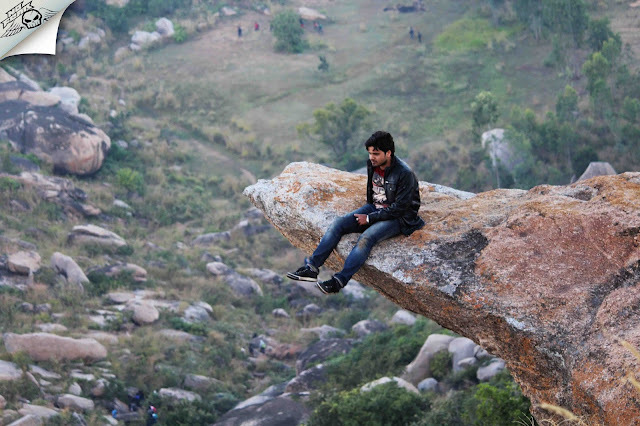 Have extreme precaution if going near it, make sure the rocks are not wet and also shoe has good grip. Its time to head back unlike in most of the places where descend is easy at this place it is little tricky as one need to cross big boulders. 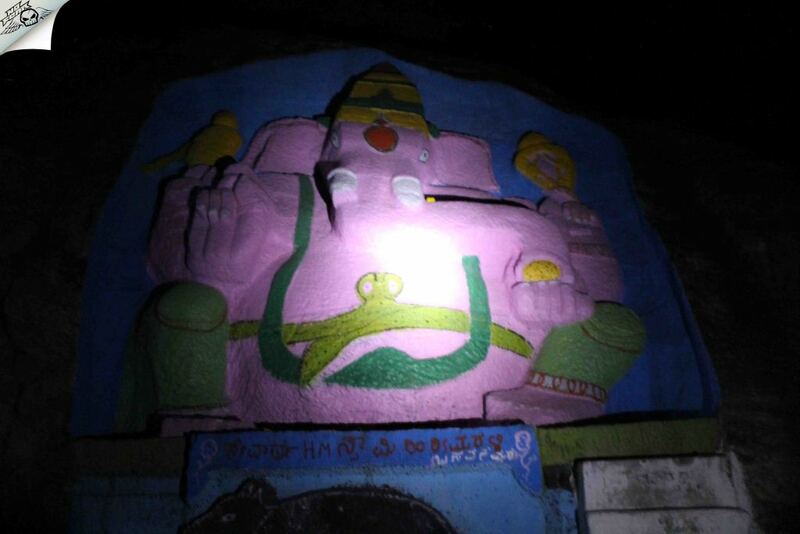 It took around 45 minutes to reach temple at the base, temple was closed so couldn't get much opportunity to explore it. 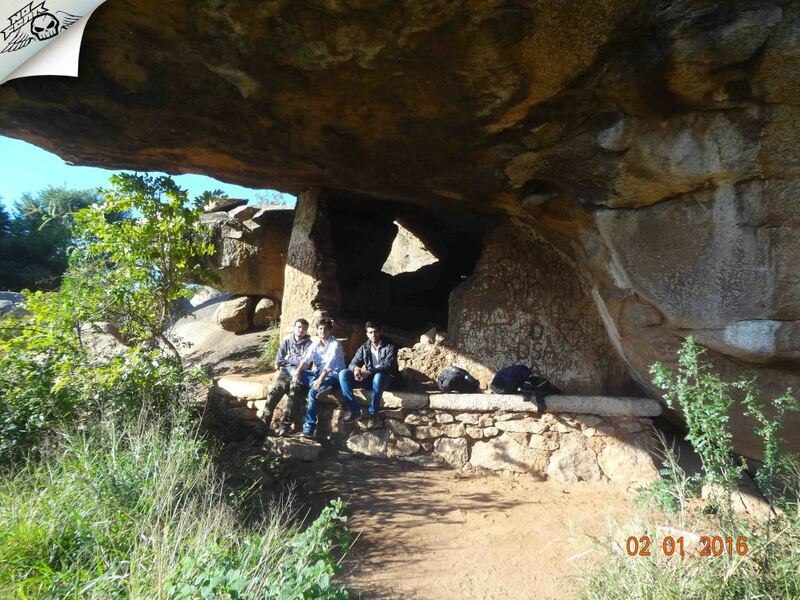 It was 9 am by the time we left the place, we had plans to visit Thonnur kere which is just 10 km from this place. We had to walk around 1 km till the main road to get auto. 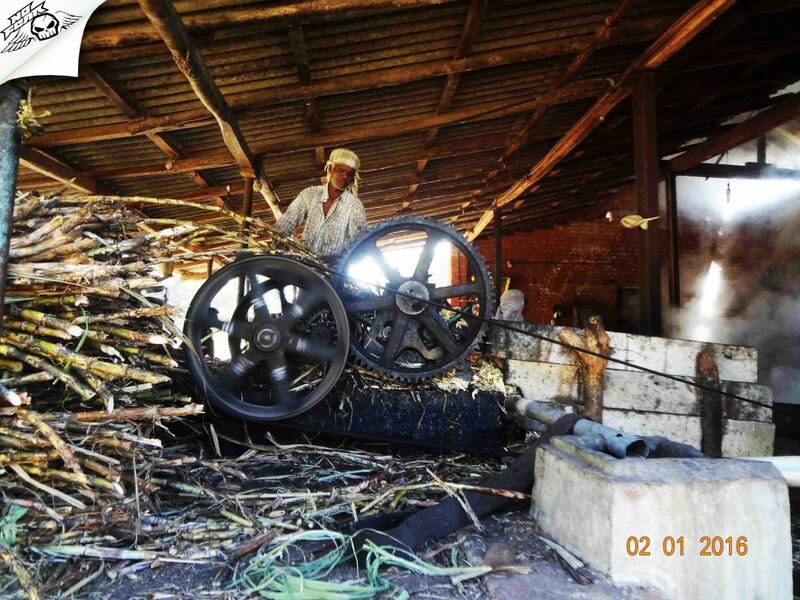 There was Jaggery plant en-route, we stopped there to see the process and had a Jug of sugar cane juice. A private bus dropped us at Padavpura town, as there are no good hotels we had to rely on road side hotel and believe me it was one of the best breakfast I had. We ate as there is no tomorrow until our stomach refused to take anymore food. Thonnuru Kere Backwaters: We came to the bus stand, we took shared auto till the kere thonnur village (private auto would charge 150 Rs for one way). Auto dropped us at kere thonnuru village from where lake is 1.5 km far. A lady in the auto informed that lake is very near and takes hardly 5 minutes of walk, but it was not the case. Auto driver offered us ride till the lake for 10 Rs/head but we refused and chose to walk. Though its just 1.5 km it felt really difficult, we were dead tired and the sun was upon us. We cursed that lady for misguiding us. Some how we reached left diversion to Thonnur lake, taking that route would lead us to the lake where there are shops beside the lake, you get a boat ride as well. But one of my friend told the other side of the lake where there is sand, looks like beach and is suitable getting into water. 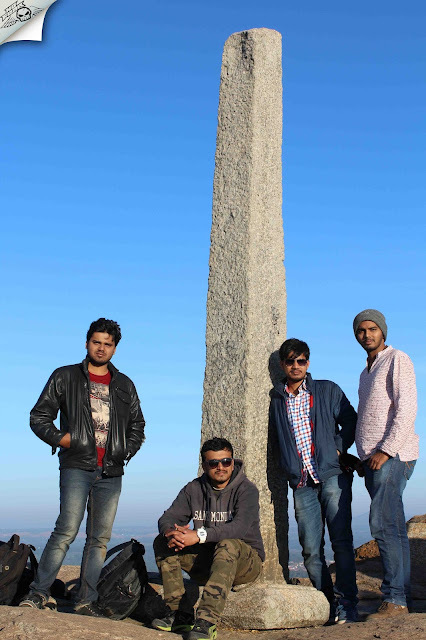 With the help of locals we finally reached the place. The spot was fab-some, there were none other than us. Place looks very cool but its not clean, there were a lot of broken bottle glasses, plastic, chicken bones everywhere. Vinay and Akhil chose take power nap while Naresh and me decided to take a dip in water. The lake is very deep and there was a recent incidence of a guy who drowned in water so we restricted our self closer to the edge. 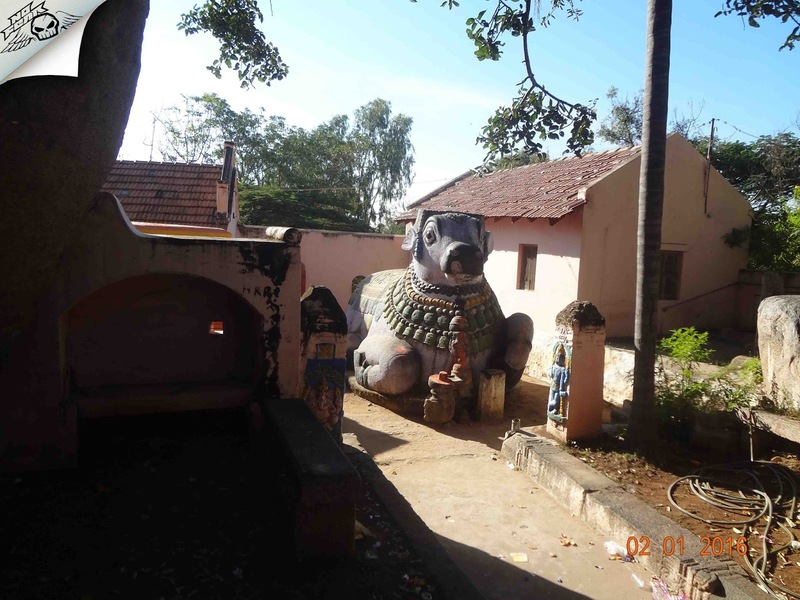 After bath we headed back to Thonnur village, walking another mile again cursing the lady. We got shared auto from Kere thonnuru village to Pandavpur from where we got another auto till railway station. 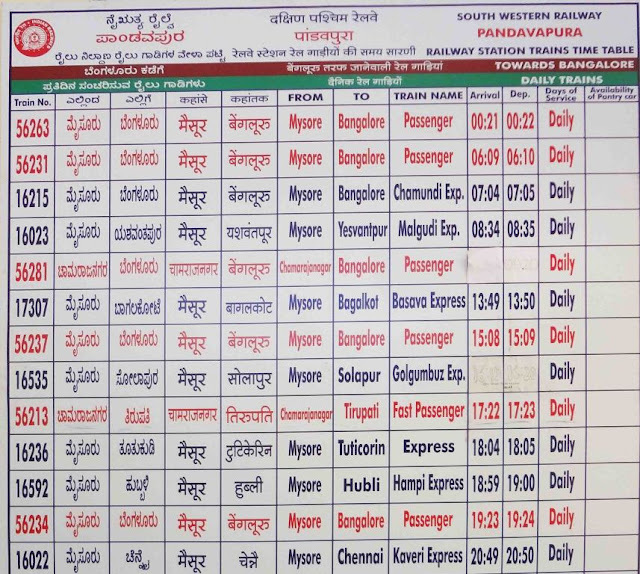 It was 1.30 in the afternoon and there are trains every half an hour to Bangalore. We boarded the express train to Bangalore at 2 pm. Everyone was dead tired but the train was packed tight. We managed to sit here and there. We reached Kengeri at 5.30 where Akhil got down, rest of us got down at Majestic. 1. There is no water available throughout the stretch so carry water, if planning night trek please carry torch without fail. 2. Even day trekking to this place is equally thrilling, doesn't need any guide as the trail is pretty clear. 2. 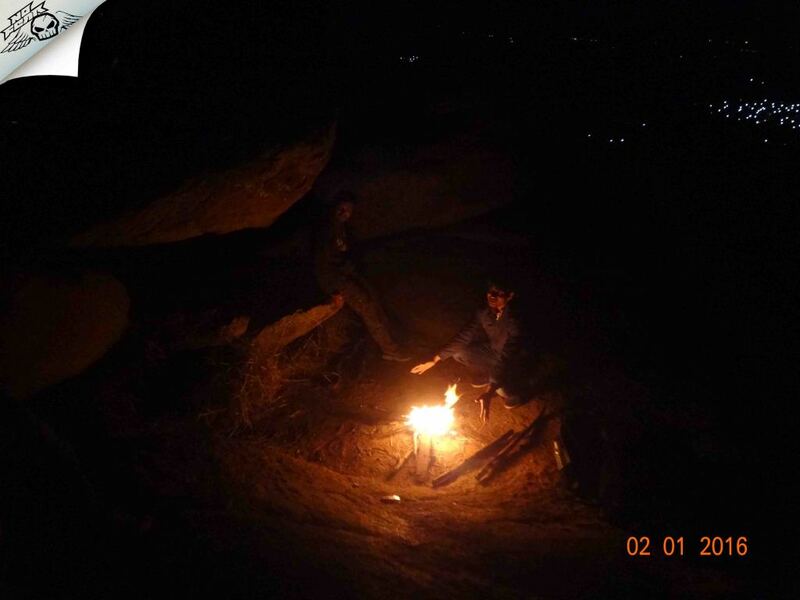 There are a lot of organizations who conduct regular day/night trek to Kunti betta. Good one Sagar...Nicely guided...Keep travelling and keep posting...!!! 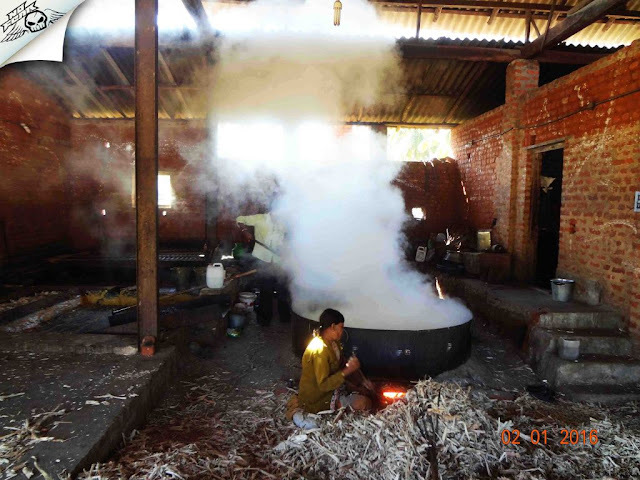 Great blog.. we used it as a guide for today's trek.